"The three books I chose for my extended essay are We Need to Talk about Kevin by Lionel Shriver, The Curious Incident of the Dog in the Night-Time by Mark Haddon and In the Blood; A Memoir of My Childhood by Andrew Motion. After completing all three of my books, I was very pleased with what I had chosen. 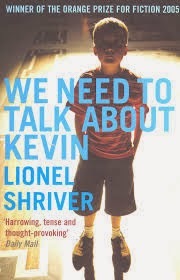 I was fairly certain I wanted to read We Need to Talk about Kevin from the beginning as I had heard of it before and the whole concept of the book sounded so appealing to me for my essay that I had to read it. When I had established that I was reading this book, my theme was clear to me; childhood and parenthood. However it is a broad theme, I wanted to especially focus on the psychological aspect of the theme as it a subject that I have always been so curious about and thought that this essay was the perfect excuse to study this in depth through reading my books. All three books are told in the first person narrative. We Need to Talk about Kevin is told from the point of view of the mother of a boy called Kevin who is the killer in a high school massacre. The Curious Incident of the Dog in the Night-Time is narrated by a boy called Christopher who has Asperger’s syndrome. The book is written in the most interesting way and includes maths puzzles, diagrams and pictures. In the Blood is an autobiography of the author, Andrew Motion’s childhood. All three of the books are very different, but they are all about the same period; childhood. I thought that because they were so different it would be really interesting to compare them as childhood is such an important time in someone’s life. It shapes you to be the person you will become and it sets a base for your entire life. It truly is the most fascinating period of someone’s life as the amount you learn in your first 10 years or so of your life will be more than you ever will learn." Read Darcy's full essay here.